Whether you're acclimatising to a new room or speakers, or seeking benchmarks for your mix, a CD of good reference material is an indispensable tool - and it pays to think hard about what you put on it. Whenever you need to troubleshoot routing or evaluate processing in any detail, it's really useful to have a set of known technical and musical test signals on hand. 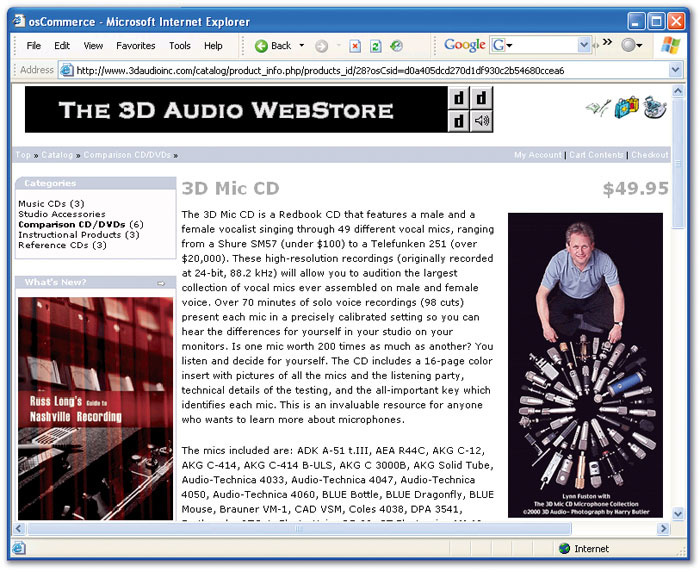 You could carry around a test-tone generator, a selection of your favourite CDs, and some WAVs of solo instrument and voice recordings for the purpose, but many working engineers prefer to consolidate all the things they normally need onto a single disc — often referred to as a 'reference CD' — for the sake of convenience. Of course, there are some useful commercial reference CDs available, such as the Court/Parsons 'Sound Check 2' test CD (www.canford.co.uk/Products/25-244.aspx), and Canford's own 'Quick Check Disc' (www.canford.co.uk/Products/25-301.aspx), but there are good reasons to compile your own: the contents of any two different engineers' reference CDs may bear little resemblance to one another, because each engineer will have different needs. That makes it difficult to decide what to include when putting one together for yourself for the first time, so in this article I'm going to be discussing the main options to try to clarify the process a little. 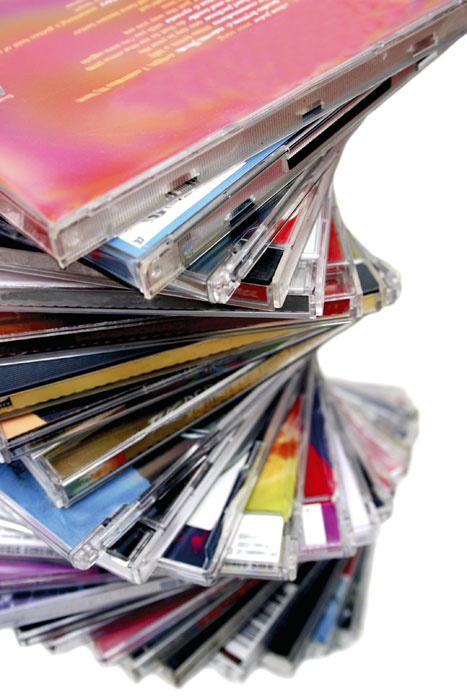 The feature reference CDs most frequently have in common is that they include a selection of the engineer's favourite commercial mixes, which are used when mixing to provide a benchmark of excellence for comparison purposes. It's very easy for your ears to start playing tricks on you when you've been working on a mix for a while, and mix references (as these tracks are often called) are one of the most powerful tools available to the engineer to keep the sound on the straight and narrow, so that it can compete with commercial mixes. But what tracks should you use? The selection of mix references is a topic which seems regularly to exercise the SOS Forum (www.soundonsound.com/forum), and if you're looking for suggestions it's certainly worth searching for threads on this subject. I've also found that when you have a few tracks you like, seeking out other productions from the same mix engineer can be very fruitful. 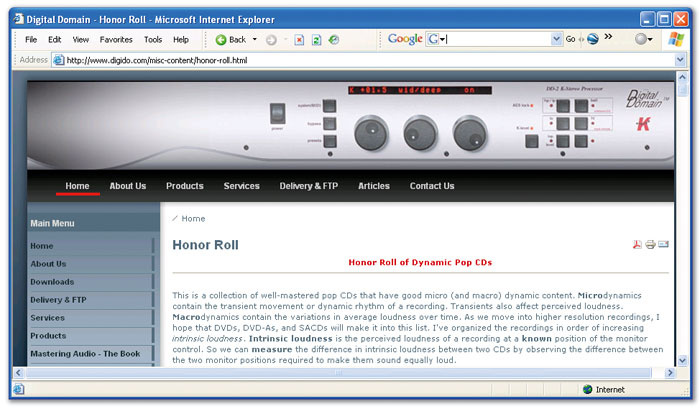 However, there are also a few more sources which can be handy, not least the list of tracks that Hugh Robjohns provided when discussing this subject in SOS September 2003 (www.soundonsound.com/sos/sep03/articles/testcd.htm). Top mastering engineer Bob Katz has compiled an 'Honour Roll' of tracks he considers have been well mixed and mastered. Whether or not you agree with his stance on the 'loudness wars', it makes an excellent reference resource.Probably the best-known list of reference tracks is called the 'Honour Roll', it can be found on the web site of mastering engineer Bob Katz (www.digido.com/misc-content/honor-roll.html), and it lists over 70 albums in all styles. Even if you haven't read his excellent book Mastering Audio, a quick browse around the site should quickly reveal that Bob is a leading figure in the fight against over-loud 'hypercompressed' CDs — so (without embarking on that whole debate here) you do need to bear this in mind when looking at the Honour Roll. If, for whatever reason, you need your mixes to compete on an equal footing with typical, heavily processed modern commercial records, you may find these tracks of limited use for mix referencing. When I first started mixing, I quickly felt the need for mix references to help me stay objective about what I was doing, so I selected a couple of dozen tracks (as many as I could fit onto a CD) that I felt sounded really good. Fast forward a few years to a point where I began to feel that this CD was getting out of date, because I'd come across new tracks I felt sounded better than some of those I'd previously selected. At this point I decided to take a more methodical approach, and systematically trawled through my entire record collection for contenders, making an effort to ratify each track choice on at least three different listening systems. What most surprised me was that, after much compiling and recompiling of shortlists, only one track from my original disc remained amongst the 58 tracks I now have in my current collection: in a lot of cases, I'd instinctively selected my favourite song off an album, rather than the most useful mix reference. In other cases, less high-profile records by a given mix engineer actually sounded better than the mega-famous example I'd initially chosen — Andy Wallace's mix of Nirvana's 'Smells Like Teen Spirit' made way for his mix of Rage Against The Machine's 'Fistful Of Steel', for example. The long and the short of it, though, is that your instincts can play tricks on you — which is the whole reason to have mix references in the first place. So, while I'm not suggesting that everyone take as long-winded an approach to the selection process as I did, the more methodical you are, the more powerful a tool your mix references will become. What Makes A Good Mix Reference? Clearly, your overall judgement of sound quality is an important factor when selecting mix reference tracks, but there's potentially a lot more to it. For a start, it makes sense to select tracks that relate to the kinds of musical styles you work with, because production values can vary dramatically between styles. There's also the issue of what kind of era of record production you want to emulate — approaches to the use of compression and reverb, for example, have changed a great deal over time, and tastes continually shift as regards overall mix tonality. However, it's important to separate your opinions about the musical material from your opinions about the production. It's not that quality songs aren't important in a general sense, but it's the sonics of a track that make it a good mix reference, not the songwriting. So while I might remain to be convinced about the musical value of the Rachel Stevens, Craig David and Limp Bizkit tracks on my own reference CD, they've all proven their worth as references when I'm working in the studio. A reference track doesn't have to be used for the whole mix: different tracks can be useful for checking the different elements. 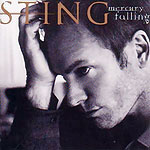 For example, Mike often uses Skunk Anansie's 'Infidelity (Only You)' (from the album Stoosh), Dr Dre's 'Housewife' (from 2001 and Sting's 'All Four Seasons' (Mercury Falling) as reference points for the sound of the bass instruments in different mixes. Reference tracks don't always have to be to your taste to be helpful. For example, because Mike prefers less air and sibilance than is present in the mix of Natalie Imbruglia's 'Torn', he is able to use the track as an 'endstop marker': if a comparison reveals his track to be this bright-sounding, it is an indication that he has pushed things further than he likes on his own mix — and probably a sign that he is suffering from listening fatigue.The use of room ambience and reverb is one area of a production that can be very tricky to get right, and here reference tracks can really help out. 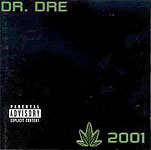 For instance, Outkast's 'Bowtie', The Stereophonics' 'Roll Up & Shine', Solomon Burke's 'Other Side Of The Coin', and Keane's 'She Has No Time' all take quite different approaches in this respect, so having access to all of them on my CD helps me make better judgements across a range of different styles. Mix-bus compression is another process that it's easy to overdo without some good examples to line your sound up against. If you're doing your own mastering-style processing, you may want to include references for this purpose as well, especially as regards the issue of loudness. By carefully choosing a selection of tracks that deliver the right trade-off between loudness processing and its detrimental side-effects, you'll be able to decide for yourself what your own position is in the ongoing 'loudness wars' debate and adjust your own processing accordingly. It's even more important here, though, that you make sure you can really hear what you're doing — so don't make any hard-and-fast decisions until you've scrutinised your shortlist of tracks on several good-quality monitoring systems. One final important point here: make sure you source the tracks in a format that doesn't data-compress. Files such as MP3s and AACs might seem fine for domestic listening, but when you're using the audio for referencing, the deficiencies of the data-compressed sound become more of an issue. The bottom line is that if you use lower-quality versions of reference tracks, you'll be trying to clear a lower bar — so you won't need to work as hard and the competitiveness of your mixes will suffer. There are a huge number of test signals that audio engineers use on a daily basis for different purposes. For most of us working in music production, though, there are a few which are particularly well-suited to dealing with common studio setup and calibration tasks, and as such these can be worth adding to your reference CD. Watching your speaker-cone excursions while playing a subsonic waveform such as this can reveal both the relative and absolute phase of the audio being delivered by a given set of monitors.Pink noise is a common choice for quick frequency-response checks, but more important for small studios in my opinion are slow low-frequency sine-wave sweeps, which highlight problematic resonances and rattles in the room. A frequency range of up to around 250Hz will usually be all you need, but you should try to make it easy to identify what frequency you're listening to at any given time. One solution is to record a low-level audio commentary alongside a smooth sine sweep, but I more often use a series of tones at semitone steps (it may be worth having the steps go across the whole audible frequency spectrum), with the timings of the different frequencies documented in a table alongside my printed track-listing. Another sine-wave signal that's certainly worth considering as well is the 'GLITS' file that Hugh Robjohns described in SOS September 2003 (www.soundonsound.com/sos/sep03/articles/testcd.htm), which can niftily combine channel identification, level calibration, and a tuning reference. 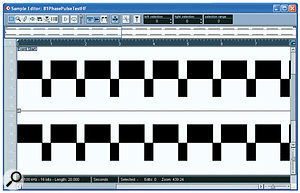 (Another version, BLITS, is now available for surround sound systems as well: http://wiki.ibs.org.uk/faq/index.php?title=BLITS). You can also use it for checking polarity through various elements of your system, but it's not quite as good for assessing the relative phase of left and right speakers. A better test for this is a file that has a repeated speech signal alternately in phase and out of phase — you could use something other than speech if you want, but speech is the most common choice because the script enables you to identify the in-phase and out-of-phase versions without any reference to track timings. 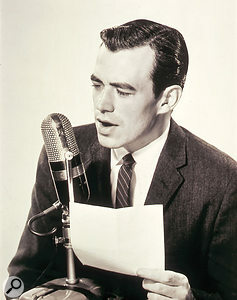 If you feel that absolute polarity is important (in other words, if you agree with producers such as Jay Graydon and Chuck Ainlay that there's a sonic difference introduced by inverting the polarity of even isolated solo signals), then having some means of testing the absolute phase of your speaker system will also be valuable to you. 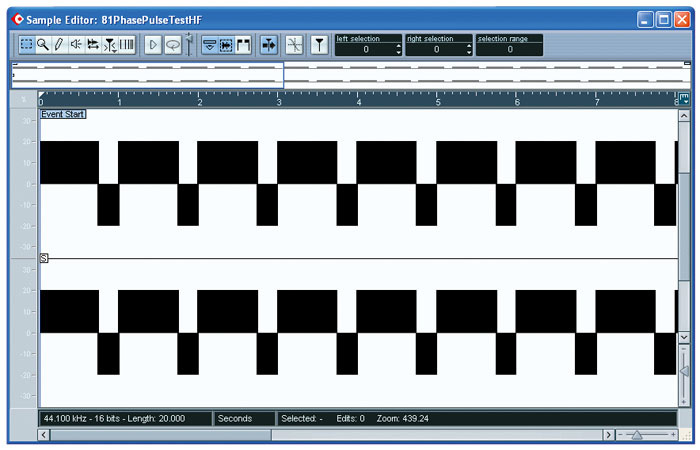 Some test-tone generators can produce a dedicated pulse signal which a suitably equipped analyser can interpret to provide this information, but another method is to draw a subsonic pulse wave in an audio editor, with the positive part of the waveform longer than negative part. You can then simply watch the speaker-cone excursions to check that their outward excursion lasts longer than their inward one. Finally, and by no means least importantly, it can be useful to have a reference line-up tone at one (or both) of the standard reference levels of -18dBFS and -20dBFS. These are useful as sources of steady-state tone when trying to route and align signal paths, as well as to check A-D and D-A converter calibration. I also find a 'rising to peak level' tone useful, starting at -20dBFS and rising slowly and smoothly to 0dBFS — because it is an excellent tool for finding or setting peak-level compression. Getting the best out of your mix references isn't just about selecting the right tracks, though, because the way you go about making your comparisons is also an important part of the equation. The ear is very quick to acclimatise to changes in tone between mixes, so the quicker you can switch between your reference tracks and your mix, the more revealing the process is likely to be. This is one of the times when the source-selection buttons of a mixer's monitoring section or a dedicated monitor controller can be really useful, allowing you to switch instantly between listening to your mix bus and listening to the output of your reference CD. Another way to do this is to export your mix in progress as a WAV file and then import it into a new DAW project alongside your reference tracks, whereupon you can do the instantaneous switching via the track solo buttons. Two useful sources of reference material: the 3D Mic CD, featuring male and female vocals sung through 49 different popular microphones, and the A/B CD, which, as the name suggests, is intended to offer A/B comparisons of different audio equipment.It's also partly because of the ear's adaptive capabilities that I tend to edit out just the highlights of my reference tracks for inclusion on my own reference CD. That way the contrasts between the tracks become much more starkly apparent — even a five-second intro before a track kicks in can completely skew your perception of how its sound compares to that of the track before it. A beneficial side-effect of this editing is that you can fit more tracks on your reference CD, which will be important if you work across a number of different musical styles. As important as instantaneous monitor switching is the ability to level-match reference tracks with your mix, as inter-track level differences can easily confuse the evaluation process: it's common to hear anything that's louder as sounding better, irrespective of whether it actually is. Again, some consoles and dedicated monitor controllers will give you independent control over the level of your reference CD's playback, but you may find level-matching easier to do if you've imported your mix and the reference tracks into a new DAW project. The down side of referencing to super-loud modern productions is that the loudness processing becomes an important part of the overall sound, which means it can be tricky to judge whether your unmastered mix is delivering the right sound, even when the levels are matched. In this case I use two main workarounds. 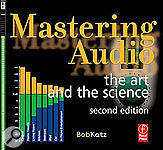 The first technique is to seek out those few productions (such as those listed in Bob Katz's Honour Roll) that have kept the loudness processing fairly subtle, and reference your unmastered mix against those on a more equal footing. The other approach is to apply loudness processing to your mix while referencing, in order to give you a better idea of how it will respond under these kinds of conditions. In the latter case, though, do bear in mind that this is just for referencing purposes — and you should always record a version of your final mix file without any such processing, to keep your mastering options as open as possible. If you take care when compiling your own set of reference mixes, there are a number of beneficial side-effects of the process. First of all, it's excellent ear-training, and helps familiarise your ears with the relative demands of mixing for different styles. Then there's the fact that you'll inevitably become very familiar with how your reference material sounds on a large number of different systems, and this means that you can start to judge other listening environments in relation to this body of experience — which is something that you'll find really valuable if you have to do any serious work in unfamiliar locations. In a similar way, test tracks can also sort the wheat from the chaff when you're auditioning monitor speakers, or indeed any other audio playback component. 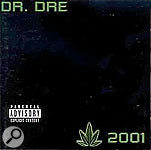 Spoken-word recordings can be very useful on a reference CD. Amongst other things, they can aid navigation through all the different test tones you're using to check for resonances in a room!If you're using your reference CD to assess the fidelity of audio systems on a regular basis, you may want to include additional tracks on the CD for this purpose — if you mix grime and trip-hop most of the time, while your mix references might be good for your mixing, they probably won't reveal the subtle audio colorations of a particular audio system very effectively, for example. This is, to my mind, where the Bob Katz Honour Roll really comes into its own: these tracks will reveal the smallest playback distortions much more starkly than heavily processed mixes. Coincident stereo recordings of classical orchestras are handy as well, for assessing the focus of the soundstage, because the combination of the sharp stereo-imaging characteristic of this mic setup and the fairly standard physical layout of the musicians in an orchestra can show up image stretching and angular distortion very clearly. I have a Sheffield Labs CD of Stravinsky's Firebird Suite and Debussy's 'Afternoon Of A Faun', which is great for this — both these scores include many exposed instrumental solos, each of which has its own clear and unique location. Something I've also found handy for these kinds of critical quality evaluations are shootout-style comparison files, designed to highlight very subtle tonal differences. 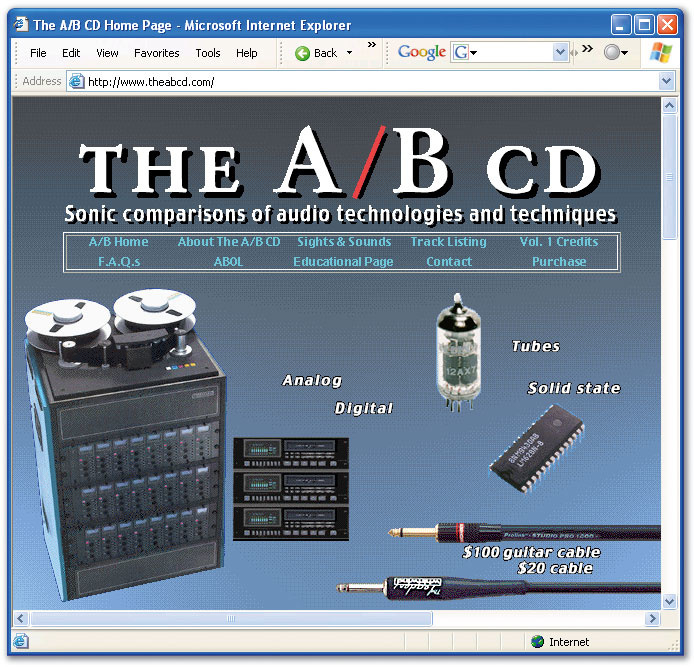 One good source for these files is the microphone, preamp, and A-D converter comparison CDs from 3D Audio (www.3daudioinc.com) — the last, in particular, is very demanding of playback systems, and if you can't hear significant differences with that you should perhaps be wary of attempting your own mastering. 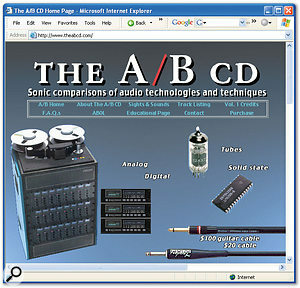 Another option is the A/B CD (www.theabcd.com). This disc provides a selection of comparisons, including analogue/digital and valve/solid-state signal-path tests, that I find quite revealing of system resolution. Another very useful inclusion is high-quality recorded speech. Because the human ear is so accustomed to tracking the finest intricacies of vocal tonality, speech is very revealing of frequency and phase anomalies in speaker systems. This and other dry solo recordings can also be pressed into service when you're auditioning the effects of signal processors. Some engineers who find themselves frequently having to work with unfamiliar gear often like to keep a whole range of short instrumental snippets to hand, as this speeds up their evaluation of the usefulness of previously untried processing options. Again, a range of instrument tracks that present different challenges to any given processor can be useful here. So recordings of instruments such as harpsichord, sitar, or 12-string guitar might test the response to complex harmonic information, while drums, piano or glockenspiel could reveal problems with transient definition. When you've compiled all the files you're going to use, and included any technical test signals you want (see the 'Testing, Testing...' box for more details on the ones you could include), you can simply burn the files as an audio CD. Because the point of such a CD is that it should be played on a whole range of different systems, I'd recommend using high-quality branded CD media and burning the disc, where possible, at the optimal speed (as determined by your choice of CD-burner and media — while the faster speeds tend to be less reliable, the slowest possible isn't necessarily the best), because this makes it more likely that it will play on a full range of systems. 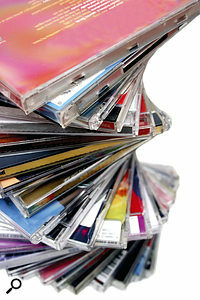 I've found that domestic and car systems in particular can be very fussy about what kinds of CD-R discs they play. It's not difficult to end up with 50 or more tracks on a reference CD, particularly if you work with 'edited highlights', as I tend to, so it should be pretty obvious that it's sensible to keep a printed track-listing with the CD. A further advantage of this is that you can put other useful information onto the same sheet — perhaps delay-time or pitch-to-frequency tables, for example. My final piece of advice is that you remember to back up your reference materials in something like WAV format, so that you're able easily to reburn your CD. Mine gets quite a beating on a daily basis from being carried around everywhere and flung in and out of different CD players and computers, and as it gets scratched it gets less reliable, so I tend to have to renew it every few months. Having backups also makes it easy to recompile the CD to incorporate new tracks — tastes can change quickly in the music industry, and you don't want to get left behind.